Are you concerned about what you are feeding your poultry and livestock? Control what is in your feed by making it yourself with the help of these grinders. LaMilpa Power Mill: For wet or dry materials. 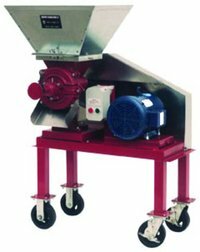 Especially suited for seeds, shells, most grains, bones, pepper, spices, coffee, tofu and similar materials. Adjustable for coarse to fine grinding. Includes a pair each of coarse and fine burrs. Grinding capacity per hour is up to 300 lb. fine and 800 lb. coarse.Package is shown in photo and includes; base frame, electric motor with starter, on/off controls and thermal protection, plugged power cord, v-belt, motor pulley, and safety belt guard (Hopper and Mobile base frame with casters not included in package. This item must be shipped by truck. Fully Wire 5hp motor, starter and 25ft plugged power cord. Optional Mobile Base Frame with 6" diameter casters and brake kit with a discharge height of 18", 24" or 38"
Please check the capacity of your electric service prior to ordering packages with electrical motors.